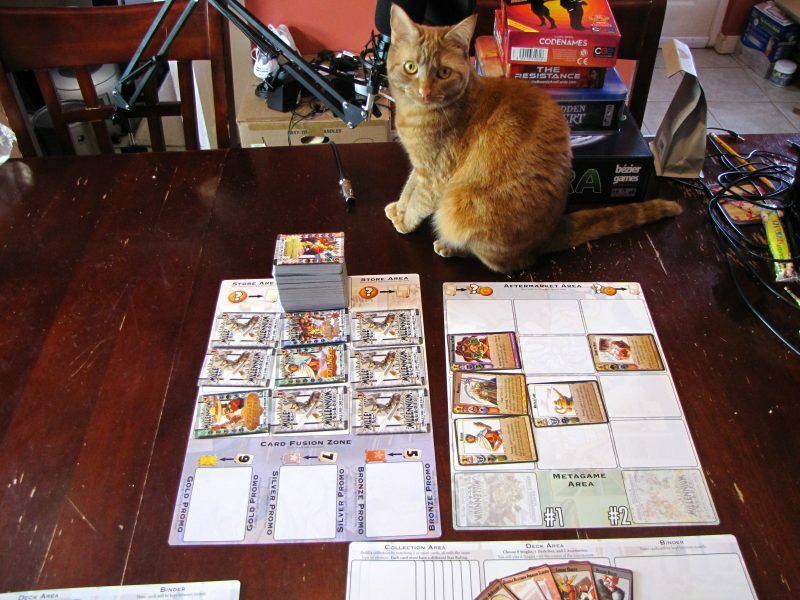 After quickly reading through the “set-up” portion in the Millennium Blades rulebook, I found myself sitting in front of a stack of cards about five inches tall. Apparently I was supposed to shuffle this monstrosity. Clearly I misread the rulebook. There is no possible way I had created this deck correctly. In fact, we managed to plow through perhaps two-thirds of that deck in a three player game. I suspect in a full-sized five player game we might have had to pause to re-create the draw pile at some point. The point is, in a game of Millennium Blades you’re going to go through through a lot of cards. In fact, you’ll be spending an hour of real-time play (as in, timed with a stopwatch, everyone acts simultaneously in a mad, frantic rush real-time play) staring at cards, quickly passing judgement on them, and trying to figure out what on earth you’re going to do with them all. 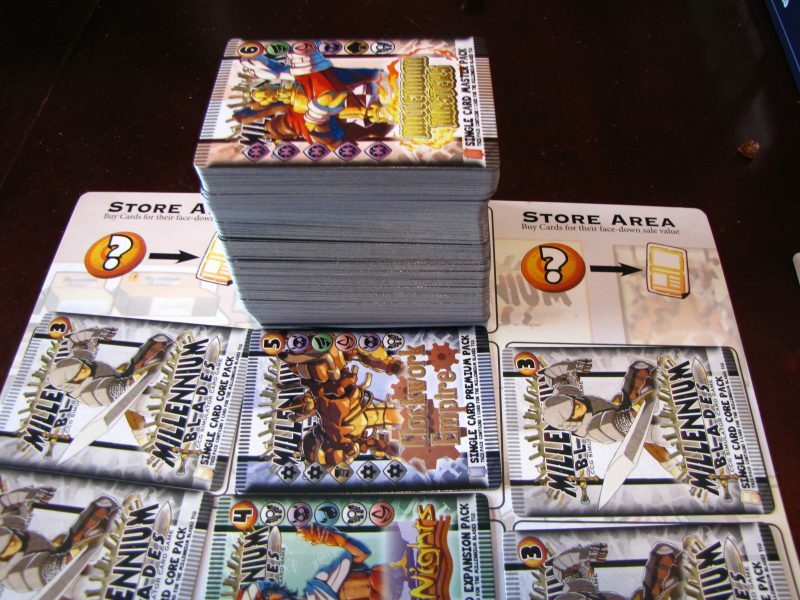 See, Millennium Blades is a game about being a collectible card game player (think Magic: The Gathering or Yu-Gi-Oh). 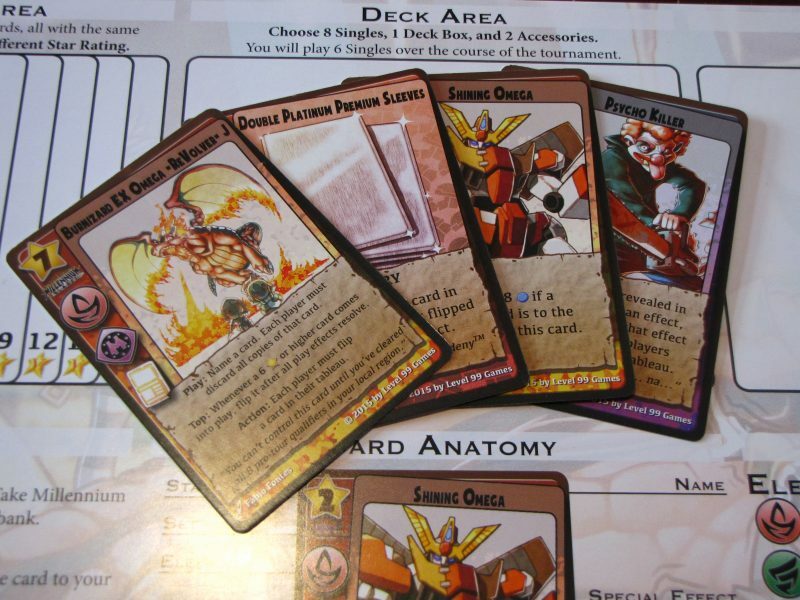 Throughout the game you’ll be buying booster packs, assembling decks, and buying and selling cards in the aftermarket. All of this happens in real-time rounds that last about 20 minutes. Between each of these rounds there’s a little mini-tournament using the game’s own clever card game system. So really there are two games here: the timed deck-building game, and then the tournaments. Neither are good enough to sustain their own game, but together they form a neat package. Going into the game, I thought that the tournament would be somewhat of an afterthought, but after a couple of plays I think it’s the stronger half. I suspect that the tournament segment was actually carefully considered, and that I underestimated it because it’s less exciting to talk about–”It’s a REAL-TIME game of buying and trading cards in a frantic mad rush of money and bargaining, and then at the end you play some mini-game with the cards”. But I think there’s something to this mini-game. It packs quite a bit of strategy into playing a mere six cards. There are two key interactions: flipping and clashing. Each card has some kind of ability on it–maybe it’s a continual benefit to the cards you play, or maybe it’s a certain number of points at the end of the tournament. But some cards have one-time use actions on them. When you use that action, you flip the card over. Some cards let you flip over opponent’s or your own cards. There are some cards that give benefits at the end of the tournament for how many cards are flipped over (or not flipped over–every possible synergy is explored). Finally, there are cards that have an ability that triggers when they are flipped over, but they do not have the ability to flip themselves. The cards are Very Serious, obviously. Clashing pits your “top” card (i.e. 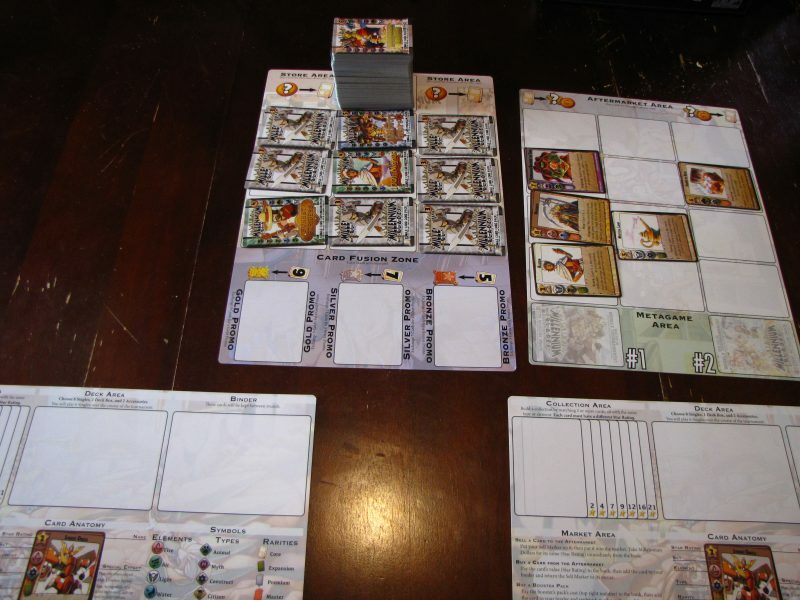 the card on the far right of your tableau) against an opponent’s top card. Sometimes there’s even a free-for-all clash where everyone’s involved. This is a simple matter of comparing strength values of the cards, plus the strength value of a random card drawn from the top of the pile to add a bit of randomizing flair. The threat of your cards getting flipped and the threat of clashes add a lot of spice to the deckbuilding. Otherwise, it’s a matter of finding cards and effects that work well together to combo for the most points. If this was all the tournaments had to offer it would be dull. Flipping and clashing keeps you honest–banking everything on one particularly high-powered combo can be very risky because an antagonistic flip-heavy deck by one of your opponents can easily kill it. Additionally, when playing your cards, you need to be constantly aware of the power level of your top card compared to the players across from you. These tensions are further strengthened by the fact that you’ll be competing in three of these tournaments in a full game of Millennium Blades. The first tournament you’ll be going in mostly blind–the only clues to what kind of deck your opponents will be building will be through what cards they’re selling. After that you’ll know what kind of decks you might face and a bit of bluffing and trickery enters, as you try to predict if your opponents are going to stay with the same deck idea, or if they’re going to radically change their gameplan to counter you. Of course, if you are going to go with a completely different deck idea for the next tournament, eventually you’re going to need to sell off some cards from your previous deck to afford it. Keen-eyed opponents will see this and adjust their gameplan accordingly. The deckbuilding phase is about what you would expect. You can purchase face-down “booster packs” (represented by single cards), buy and sell cards to the “aftermarket”, or trade directly with other players. This part of the game is a lot more quiet and less hectic than I would have guessed. It’s not like Space Alert or Escape: Curse of the Temple, where everyone is in a loud, mad rush to complete everything. Since you will be spending most of your time quickly reading and evaluating cards, there’s a lot of silence and internal calculation going on. Furthermore, the game gives you plenty of time, so we never felt a ton of pressure on the clock to finish everything we wanted to. The timed portion feels more like a way to keep players from agonizing over marginal decisions rather than a means of introducing chaos. A few times everyone finished before time was up and we all agreed to stop the clock early and move on. From this, chaos emerges. But kind of a peaceful, contemplative chaos. This doesn’t mean the experience of deckbuilding isn’t fun, it’s just different than I expected. You are still confronted with interesting and difficult decisions of which cards to keep, which cards to sell, and how on earth you’re ever going to build a functioning tournament deck out of this mess. The booster pack system works very well, because while there’s some indication on the back of the cards what types and elements you might see on the other side, the frustration and elation from buying actual randomized booster packs in a real-life CCG are there. Because there is so much uncertainty and randomness in what cards you acquire, I’ve found that the deckbuilding part seems to be more about adjusting your plans on the fly rather than focusing on one particular strategy and running with it. You can try to push forward with a predetermined strategy, but you have to be prepared that you’re simply not going to be able to get the cards you need and adjust your deck late in the game. I like that aspect of improvisation, but it does seem to make the game a bit too random and shallow at first glance. I suspect as you get more familiar with the booster packs and what kind of synergies you might see, that part of the game might fade to the background. When you have no clue what the cards might contain, you’re completely flying by the seat of your pants. Again, this is fine and enjoyable, but it doesn’t make for a great game. I’d love for there to be more strategic decisions vis a vis your deck and your opponent’s decks. The mini-metagame that is already there is fantastic, and I’d love for it to be based around strategic rather than purely improvisational deckbuilding. However, this is going to be a….tall task. That massive deck of cards you begin the game with? About a third of that deck is cards from the core set, which are in every game. The other two-thirds are an assortment of 12 different booster packs. Every booster pack has its own theme and synergies. I suspect if you spend time before the game going over the contents of every booster pack with all of the players, that might improve the level of strategic decisionmaking in the game. Or, I suspect with many, MANY games of Millennium Blades you might generate enough knowledge of the cards for that level of play, but it doesn’t seem worth it. Part of me suspects a gem of a game might result, but most of me doesn’t want to dedicate that much time and effort to get there. That’s not to mention the actual physical logistics of it. Randomizing 12 booster packs into the core set takes forever, and it’s just as long of a hassle to separate them all at the end of the game. Frankly, it’s a ridiculous amount of work. After my second game, I just kept the deck I was using together. Once we get tired of those booster packs, I’ll make a new deck. This is unfortunate, because each of the packs has an interesting theme with sometimes hilarious art and nerd in-jokes, but I won’t see most of them in the game until I re-randomize. My final critique is about the victory point system. There are two ways to score victory points: turning in “collections” and placing in tournaments. Collections are simply cards that share the same type or element. Before each tournament you can turn them in for points based on how many cards are in the set. I suspect this was included as an incentive to get rid of cards, or else you might end up with an annoyingly large hand (you can only have a couple of cards for sale in the aftermarket at once in any given point in time). During the game it tends to be literally an afterthought that you cash in for a few points after you’ve built your tournament deck. Tournaments give victory points based on your placement. The final tournament rewards about 50% more points than the other two, which is fitting, but the fact that the points are predetermined based on a table in the rulebook makes it all very anticlimactic. I understand that if the points were given based on the actual score of the tournament it might cause a runaway leader problem and create risk-averse deckbuilding incentives, but the VP table is so dull. There has to be a better solution. In the end, though, I really do enjoy Millennium Blades. It’s certainly different than I expected and I am not sure if it’s going to get better over time, but it’s an absolutely unique game in my collection. Even if I only pull it out every few months I know I’ll have fun trying to build decks and outwit my friends. I will not, however, have fun shuffling that deck of cards.